Last Friday, I headed North in pursuit of Hungarian partridge and pheasants. With me were three trusted colleagues and my two loyal labs, Gabriel and Turk. We started hunting around 1pm on some new ground; at least, new to the dogs and I. We worked a creek with lots of cover, perfect pheasant habitat. Together we ended up kicking up a few roosters but had no real shots. The cover was thick and the birds were jumpy. We turned to the foothills in pursuit of huns. Then it happened. After working a hillside up to a corner, we turned down following a ridgeline. Eleven-year-old Gabriel’s tail started to wag in the familiar way, he had found a bird’s scent and by the frequency of his wagging tail it was fresh. A hun exploded with a squeak, right in front of the ol boy’s nose. I mounted my Benelli and dropped the bird. The race was on between Gabe and Turk with Gabe arriving first. His proud swagger brought the bird back to hand and the symphony was complete. 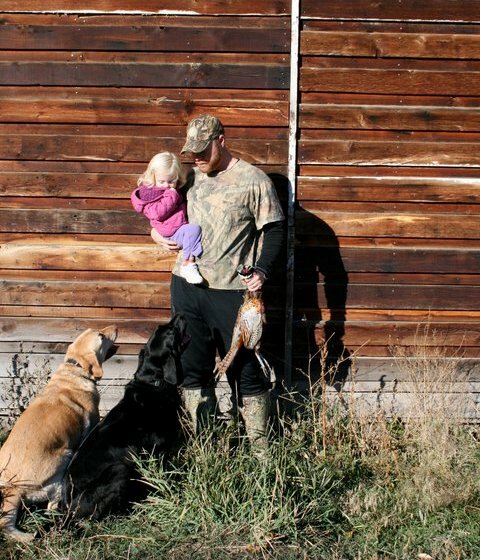 In a moment, Gabe’s hunting career and home life flashed before my eyes. His first retrieves, his best retrieves; that bond only understood by those with gun dogs. Later that evening we arrived home, cleaned the beautiful hun and put the bird in some salt water to cure for later. Gabe was already showing aches and pains from our day afield. He has arthritis in both hind legs that was brought on by hundreds of cold entries and exits out of the duck marsh. I gave him some buffered aspirin, a healthy dinner, a bowl full of water, and a little extra pat on his head. That night he woke me up twice. The pain in his eyes was palpable. Twice I sat with him and told him what a good dog he was. He wagged his tail in acceptance. The next day he worked out his stiffness and looked to have recovered. This has become more the norm than the exception. Gabriel lives to hunt; it’s the apex of decades of breeding and thousands of hours in the field. Sunday morning I again headed north, this time in pursuit of waterfowl. Gabe stayed home and six-year old Turk made the trip, a passing of the guard of sorts that didn’t set well with the elder statesmen. We had a great day with Turk making a 200-yard retrieve on a mallard and a triple blind retrieve on the last three widgeon we shot. The latter being the culmination of a summer’s work on the command “BACK”, (a victory in its own right). Upon arriving home, Gabe sniffed us with disgusted interest, still having not recovered from us leaving him home in the early hours. As we cleaned the birds he hung around but seemed to eye me in a different way. “Really Boss, this is what it has come to?” The look was painful, but reality. Retirement will happen for Gabe. For now, I’ll still take him on short stints, an hour or two, but at least we can get out. I’ll take solace in knowing that he is doing what he loves and that this love isn’t causing him too much pain. Maybe everything will work out, things will line up, and I’ll see him perform like hid did on the hun. Maybe this was his last retrieve. If it was, what a perfect way to leave the majors.